In the drum section, a “lead” snare drummer normally plays throughout the selection. The rest of the snares join on repeated sections and on “bit” parts to add accent and dynamics. The bass drummer is critical to controlling tempos and accenting the music. The tenor drummers add to the show with their twirling, and provide rhythmic fill and dynamics. 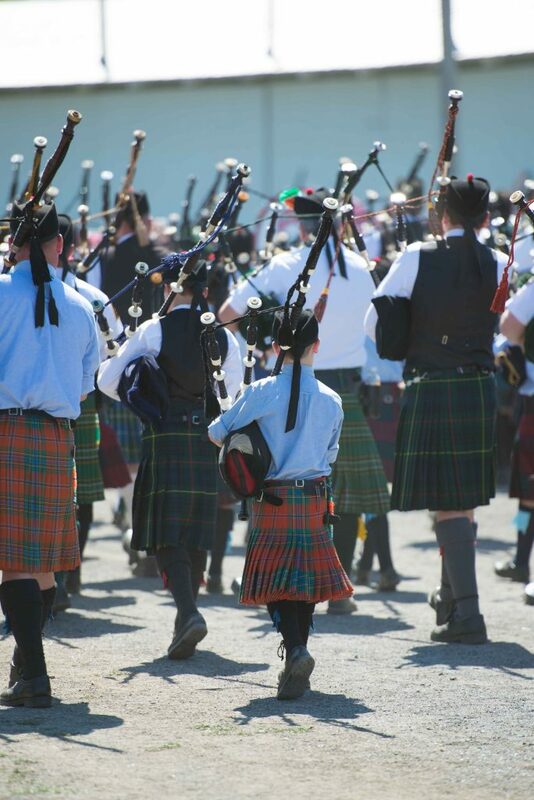 Pipe and drum sections are judged separately. 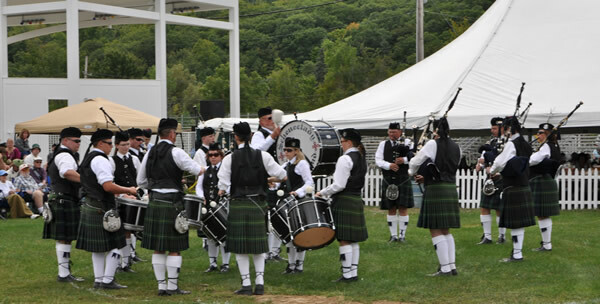 A band’s total score is computed by weighing the judges individual scores: 50% piping, 25% drumming and 25% ensemble. 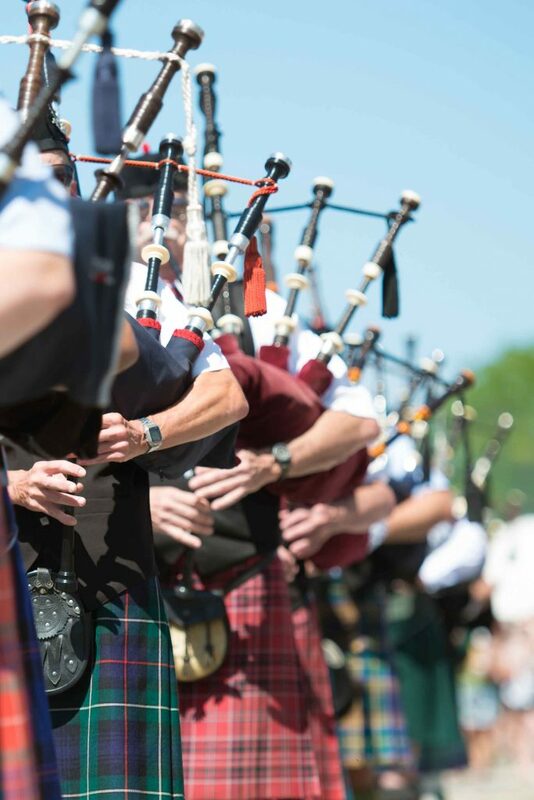 In addition to the solo events guidelines, pipe band judges look for a true sound, with all instruments sounding as one; togetherness in playing the music; a strong and precise start and finish; and clean definitive transitions between tunes. Bands form an inward-facing “circle” to improve their concentration. The Drum Major, who carries a mace or staff and leads the band while marching, is judged in a separate event where drills, dress, commands and deportment are evaluated. 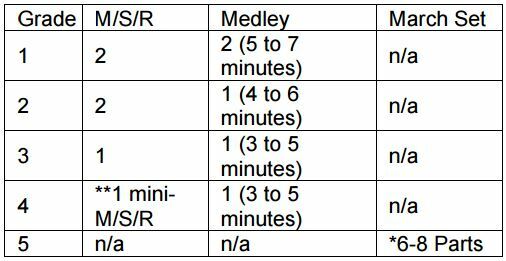 The Band Selection Requirements Requirements fall into three basic musical categories, M/S/R and mini MSR, Medley and Grade 5 March Set. For the M/S/R, all three tunes will consist of at least four parts of music and the march must be in 2/4 time. The mini MSR will consist of four parts 2/4 march, 2 or 4 parts strathspey and 2 or 4 parts reel only. The Medley will be a selection of tunes of any length, type, tempo, and time signature, which varies in overall length according to grade. No tunes played in the MSR or the mini-MSR may be played in the medley, and vice versa.